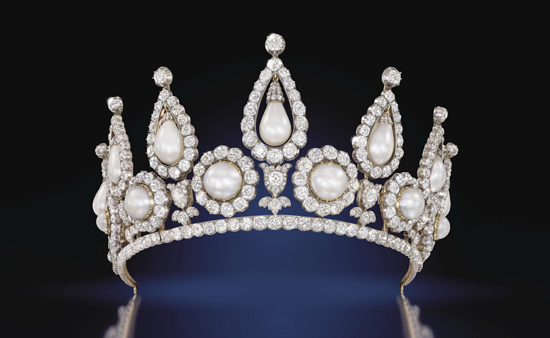 A truly stunning 19th century natural pearl and diamond tiara comes to auction next month at Christie's, in London, with an estimated price of £1-1.5 million. With the strength of interest in natural pearls in recent years, and of course the royal wedding, expectations are high for this unique sale. The Rosebury Tiara is the centrepiece of an evening of rare, historical and opulent jewels. Being sold from a private collection, the tiara was originally created for the Countess of Rosebury, who upon her father's death in 1874 became the richest woman in Britain. The bridal tiara itself boasts 13 natural saltwater button and drop-shaped pearls, ringed with diamond clusters and florettes. It is believed to have been acquired as a piece of bridal jewellery for the wedding of the Countess, perhaps making it the ultimate statement in bridal accessories. 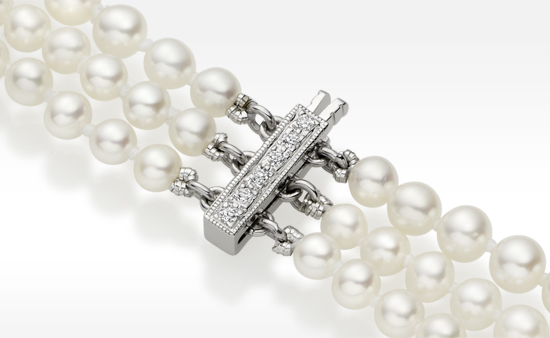 A matching pearl brooch and bracelet is also being sold as a separate lot, with an estimated price of £300-400,000. The auction is being held at 2pm on 8th June at Christie's, King Street, London. In June 2011, it was announced that the Rosebury Tiara had been sold for a dazzling £1,161,250 at auction at Christies.